While playing catch with Doc, I noticed Rebel was trying with some urgency to pull down my sweatpants(yep, Miss Cheryl the fashion plate!). Ha! Once I stopped laughing, I firmly but good-naturedly informed him that sometimes, loving someone means letting her keep her pants on. I feel that this lesson can’t be learned young enough these days. Boys are getting fresher and fresher! Pic Post: Stuck on Me! 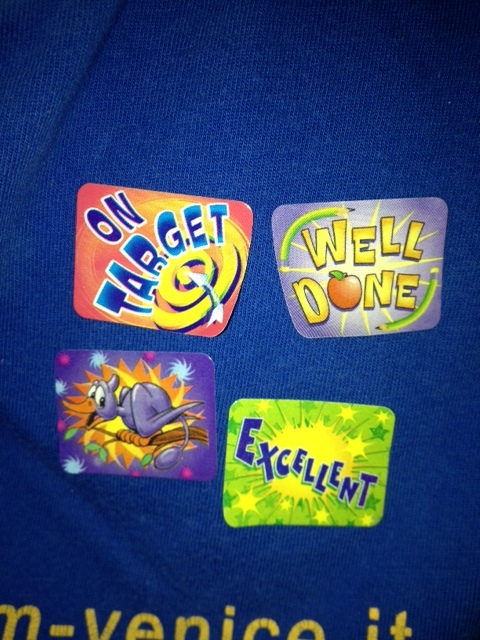 While spending the day with Doc and Rebel, Rebel felt I was doing such a good job that he rewarded me with, not one, not two, not even three, but FOUR reward stickers! This is the kind of sincere praise that makes happy my nannying days! Y'all need your Supernanny fix right away? Just enter your email address to receive a message whenever Miss Cheryl makes a new post! Prices & descriptions of services outlined here! For even more testimonials click here! Oh the Places Y'all'll Go! Digital publication for the modern parent.